CommentLuv is a widget for blogs which collect users comment. Generally it stands instead of blogs default commenting system in wordpress or blogger. Basically bloggers use third party comment plug ins like CommentLuv or Disqus for getting all comments back if they changing their blogging platform. Why CommentLuv enabled blogs are important? If you are totally newbei in blogging world then read this article [What does SEO mean] for the basic knowledge about Optimization. Except CommentLuv all other comment plugins are giving nofollow backlink to its commenter. 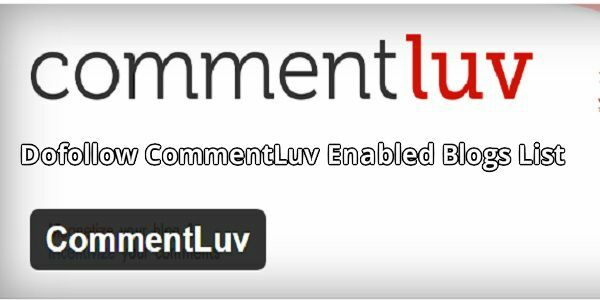 As CommentLuv allow us to get dofollow backlinks by putting comments, thats why it’s so important for new bloggers to get some valuable backlinks with less effort. Spaming is not the way. And spammers are always suffering soon or later. So never try to spam, Read article carefully before putting comment on it. Your comment should be relevant to the main topic. Always try to put around 250 words comment and never put only spamy words like “Nice post” “Good post”, remember if site author publish your comment after moderation then you will get a valuable backlink which worth much more than writing a long comment. How To Put My Link In Comment? I saw many bloggers include their blog homepage link after comment as like forum signature. This is a bad practice, Your homepage will linked directly from your name in every comments and which is dofollow as well. So this is not necessary to put homepage link in comment footer. Also don’t include any irrelevant post link in comment body, If you have a post or content in your site that perfectly match to the topic or somewhat relevant, only then add this link. This all is for keeping your comments quality, which can be worthy for post author and he will publish it willingly. And also for ensure this, when search engines saw that comment they index it as a backlink of your site and don’t mark it as spam. I also provide 160 High PR Dofollow EDU and GOV Sites list. And 200+ High PR Dofollow Blog Commenting. By this article tries to show the importance of the do follow links. And also list is given by which we get the do follow links and grow up of website.